I don’t think I have ever been as disappointed in the Boston Bruins as I was yesterday after watching them mail it in against the lowly New York Islanders. How many times can they play that type of game before something gives? That’s a separate conversation for another time, but it was a frustrating feeling I wanted to shake. So when the Pittsburgh Penguins and Washington Capitals game came on last night I debated tuning in. I was kind of all set with hockey at that moment. But being the puck junkie I am I turned it on anyway. I quickly realized, in an even more depressing way, how bad the Bruins were Monday. The Penguins and Capitals put on a highlight reel show. Forty. 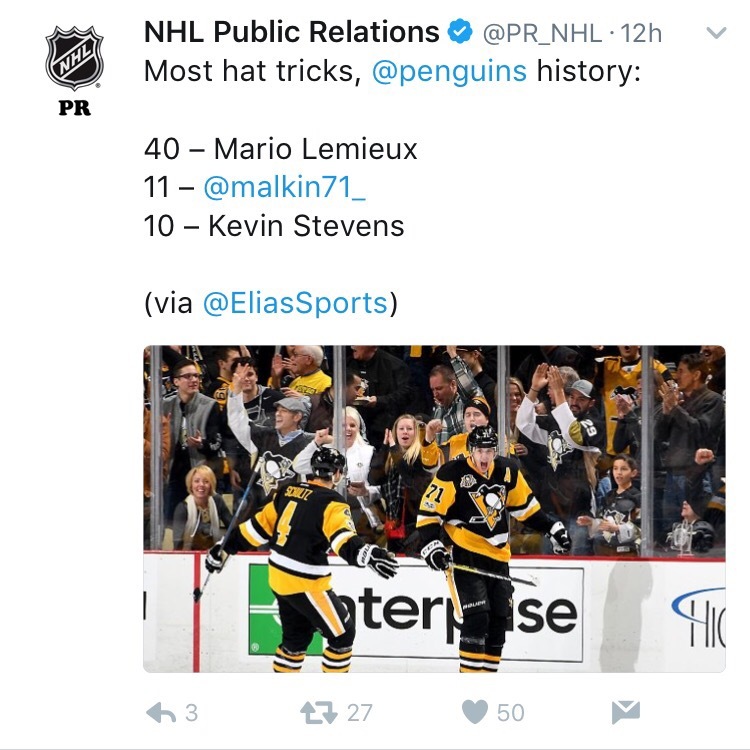 Mario Lemieux had forty hat tricks in his career. And he scored 9 of them during the 1988-89 season alone. Wayne Gretzky even had ten hat trick’s in one season, twice. That’s insanity. Last nights Pens and Caps game was like a time travel experience. It felt like the old days of NHL hockey. It was just a spectacular display of skill and entertainment. It was fun. And I was a spectator ripe for the picking. I had the Bruins garbage fire performance still smoldering in my brain. Any decent hockey game probably would have made me happy. But the Malkin/Lemieux hat trick comparison woke me up. It was a reminder of how great the NHL game once was and still can be. Because not only was the Bruins performance Monday brutal, it comes in an era where even a good game is still often a 3-2 grind. So when a game is bad, it’s real bad. Yet Capital’s fans last night experienced an “exciting loss” to Malkin and the Pens, Mario-era performance, in world where that just doesn’t happen anymore. It was refreshing. We may not see 40+ career hat trick games from individual stars again. And the Bruins may not have what it takes today. But the NHL should do what it reasonably can to create more entertaining offense like last night for their stars, regardless of whether the teams are winners or losers. Follow us on Twitter @BostonPucks. Reach out. Let’s talk hockey.